In today’s market embedded software plays a large part to your success on product-to-market. While product development cycles get shorter with tightening budgets and fewer engineering resources, the demand for more product features without compromise on high product quality level and on-time delivery remains critical. To outperform your competitors, the eT-Kernel Platform is your solution! *Expected to be launched in 2015. 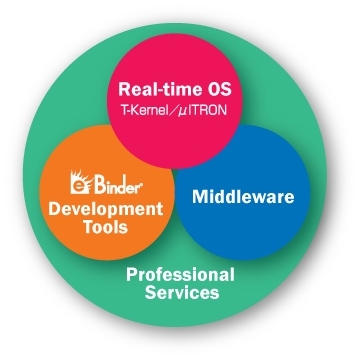 The eT-Kernel Platform is the latest platform solutions suite from eSOL, and encompasses high-quality, proven　RTOS, middleware, and development tools　seamlessly integrated together to allow you to concentrate on application development. With 40 years of embedded software experience, eSOL also offers professional services to back up those deploying the eT-Kernel Platform. This includes providing driver and firmware development, and porting to your custom hardware. You can jump-start your application development because our RTOS, middleware, and IDE are all integrated and tested. 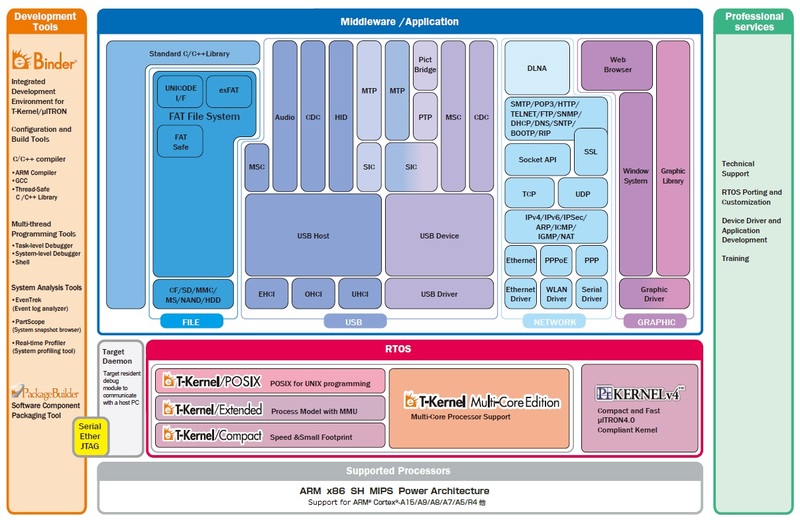 They support major embedded processors and their evaluation/development boards from ARM, MIPS, SH, and Power Architecture. Our software has been optimized to harness the power of your application programs and products. Your application migration from one processor to another is very easy, because our run-time software is provided in full source code format and uses universal APIs on all platforms. Our RTOS is ultra scalable, from thread-based microkernels to process-based POSIX-compliant operating systems, on both single and multi-core environments. Our true building block software components give you flexibility to use the software that you need. World brand-name corporations have been using our software and solutions in their core products, from consumer electronics to the automotive industry. Our 200+ embedded software engineers stand right behind you, with their expertise in the multiple embedded software field. We offer custom development services, from low-level driver and firmware development, to high-level application development. The eT-Kernel Partner Program is designed to thoroughly support our customers’ embedded systems development in cooperation with our partners so that their products, whether hardware or software, are seamlessly integrated into the eT-Kernel Platform.